We know you have choices when looking for classes but we have consistenly been named Baltimore's Best and have been doing classes for over 20 years with huge success. Some classes in Baltimore are less expensive, BYOB, or print your own recipes. We include it all (recipes and drinks), and are a technique hands-on based class doing an average of 8-10 recipes per class and are 3 or more hours long depending on how much discussion and fun we are having. as well as enjoy FREE parking in our nearby lot too! so you can let us know of any food allergies or needs. WE ARE HERE 9-10 PM DAILY TO TAKE YOUR INFORMATION AND SEND YOU AN INSTANT GIFT CERTIFICATE TODAY .... RIGHT THRU CHRISTMAS EVE.... We are also open December 26th , and we'll help you! We also offer parking for our patrons located in a private lot on a first come, first serve basis located at 1910 Aliceanna St. This lot is about 1/2 block east of Pierpoint on Aliceanna St and the driveway entrance is directly across from another restaurant called DarBar. We have the first four spots in this lot and they are marked as such on the fencing in front of the spots. IF YOU WERE GIVEN A COOKING CLASS TICKET OR GIFT CERTIFICATE, PLEASE CONTACT US TO JOIN AND BRING THAT TICKET OR CERTIFICATE WITH YOU TO THE CLASS YOU JOIN! It is imperative that you bring that ticket or certificate with you to the class! BY POPULAR DEMAND - COME LEARN THE BASICS OF THAI AND ASIAN COOKING INCLUDING CURRIES, PAD THAI, DRUNKEN NOODLES, SPRING ROLLS, AND USE OF LEMONGRASS AND CHILES. SELLS OUT FAST, SO JOIN QUICKLY! COME LEARN A MODERN STYLE OF COOKING ITALIAN WITH TRUFFLES AND FLAVORED OILS, AS WELL AS COOKING WITH POMEGRANATE AND LIGHTER METHODS OF SALAD MAKING, AND SHIMP SCALLOPINE AND TUSCAN CHICKEN SOUP. WE WILL ALSO MAKE AN ITALIAN BOMBOLICINO COOKING WITH ESPRESSO AND CHOCOLATE. COME TAKE A CLASS ON BARBEQUE FROM ALL OVER THE WORLD. WE WILL TEACH YOU HOW TO MAKE YOUR OWN RUBS, WET AND DRY MIXES, AND BARBEQUE SAUCES, FRUITY AND SAVORY AND SPICY. WE ALSO WILL COVER NORTH CAROLINA, TEXAS, KOREAN, JAPANESE, AND INDIAN STYLE BARBEQUES. WE WILL ALSO COVER HOW TO SMOKE WITH STYLES AND WOOD CHOICES FOR GOOD SMOKING AND GOOD FLAVOR. Just Added - 10 spots open! THIS IS A GREAT CLASS OR GIFT CLASS FOR THE VEGETARIAN COOK! THIS CLASS WILL COVER VEGAN AND VEGETARIAN COOKING IN A CREATIVE STYLE WITH SPICE MIXES AND COMBINATIONS SURE TO PLEASE ANY VEGETARIAN OR NON- VEGETARIAN COOK, OR FOR THOSE WHO ARE JUST LOOKING TO COOK HEALTHY VEGETARIAN MEALS FOR FAMILY OR FRIENDS. COME LEARN THE ESSENTIALS OF HOW TO BONE A CHICKEN, CUT MEAT, AND FILET FISH. WE WILL ALSO COVER BASIC USE OF DIFFERENT KNIVES AND CLASSIC VEGETABLE CUTS, AS WELL AS HOT TO SHARPEN KNIVES. WE WILL THEN MAKE AN INTERNATIONAL INSPIRED MENU FROM THE THINGS WE HAVE CUT UP AND LEARNED, AS WELL A LESSON ON A FEW SAUCES AND SPICE MIXES. THIS IS A GREAT CLASS FOR A BEGINNER COOK AS WELL AS EXPERIENCED WHO WANT TO LEARN NEW CUTS. SIGN UP QUICK AS THIS CLASS SELLS OUT FAST! COME LEARN THE NUANCES OF FISH COOKING AND FISH SAFETY. COME LEARN NEW FISH DISHES, FISH BUYING SAFETY, CREAM AND BUTTER SAUCES. HOW TO CLEAN SCALLOPS, AND LOBSTER AS WELL AS PREPARING BISQUE, PAELLA AND BOULLABAISSE, THAI INDONESIAN MUSSELS AND CLAMS, AS WELL AS MEDITERRANIAN PREPARATIONS OF FISH. COME LEARN THE ESSENTIALS OF BBQ FROM ALL OVER THE WORLD; HOW TO MAKE DRY RUBS; WET BARBEQUE; AS WELL AS FRUITY, SAVORY, AND SPICY BARBEQUE SAUCES. WE WILL COVER NORTH CAROLINA, TEXAS, INDIAN, KOREAN, AND JAPANESE BBQ STYLES. WE WILL TEACH TECHNIQUES OF SMOKING AND WHICH WOODS ARE RIGHT FOR EACH STYLE OF SMOKING. COME LEARN HOW TO MAKE TRADITIONAL SPANISH FOODS SUCH AS PAELLA, MAYAN CHICKEN, PERUVIAN SHRIMP, DIFFERENT TAPAS IDEAS, AS WELL AS SPANISH FLAN. COME LEARN SOME BRUNCH CLASSICS SUCH AS BANANAS FOSTER, PUMPKIN WAFFLES, HOMEMADE POP TARTS, CHICKEN BISCUITS WITH GRAVY, THE ART TO OMLETTE MAKING , FRUIT COMPOTE, AS WELL AS CREATIVE BLODDY MARYS. COME CELBRATE CINCO DE MAYO BY LEARNING THE ESSENCE OF MEXICAN AND SOUTHWESTERN CUISINE. WE WILL COVER TRADITIONAL CARNITAS, FAJITAS, HOMEMADE TORTILLAS, GUACAMOLE, QUESO AND SALSA, AS WELL AS ENCHILADAS AND TORTILLA SOUP CULMINATING WITH CREATIVE MARGHERITAS!. ​COME LEARN THE ESSENTIALS OF BBQ FROM ALL OVER THE WORLD; HOW TO MAKE DRY RUBS; WET BARBEQUE; AS WELL AS FRUITY, SAVORY, AND SPICY BARBEQUE SAUCES. WE WILL COVER NORTH CAROLINA, TEXAS, INDIAN, KOREAN, AND JAPANESE BBQ STYLES. WE WILL TEACH TECHNIQUES OF SMOKING AND WHICH WOODS ARE RIGHT FOR EACH STYLE OF SMOKING. COME LEARN THE SECRETS OF PIERPOINTS CRAB CAKE, FRIED CHICKEN, BISCUITS, MARYLAND SEAFOOD SOUPS, MARYLAND SEAFOOD STEW, AND OTHER MARYLAND SPECIALITIES. THIS CLASS IS A NEW ADDITION AND GREAT FOR BOTH LOCALS AND VISITORS ALIKE PARTICULARLY IF YOU ONLY KNOW OF MARYLAND BLUE CRABS AS A 'MARYLAND FOOD' ! COME LEARN THE NUANCES OF FISH COOKING AND FISH SAFETY FOR THE SPRING AND SUMMER MONTHS. LEARN GREAT SALADS, SOUPS, AND SAUCES TO GO WITH THE FISH AND SHELL FISH WE WILL BE COOKING. THIS IS A GREAT CLASS FOR THOSE WHO LIKE TO EAT HEALTHY FISH DISHES, BUT WANT TO LEARN NEW WAYS TO COOK THEM AND PROPER TECHNIQUES FOR COOKING AND BUYING FRESH! THIS CLASS IS $75 - NOT DISCOUNTED DUE TO THE FOOD WE WILL BE COOKING! COME LEARN IDEAS ON HOW AMERICAN CUISINE HAS EVOLVED MODERN POT ROAST, LOBSTER MAC N CHEESE, CALIFORNIA STYLE SALADS, HOW TO MAKE A CREATIVE GUMBO, SQUASH SOUP, MULTI LAYERED FLAVORED MEAT LOAF , GINGER LEMONGRASS PUMPKIN TART AND ... MORE. NEW CLASS! COME LEARN HOW TO MAKE PAELLA, MAYAN CHICKEN, PERUVIAN SHRIMP, DIFFERENT TAPAS IDEAS, AS WELL AS SPANISH FLAN. 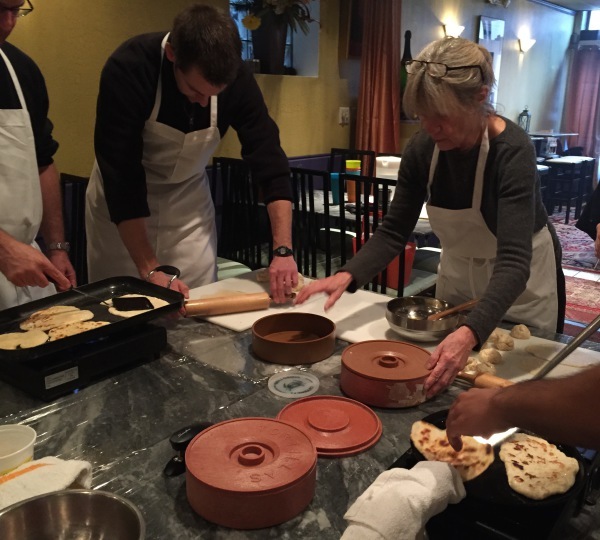 Learn the key elements of Indian cuisine! We will focus on chutney, breads, curries, regional masalas, even Indian BBQ. 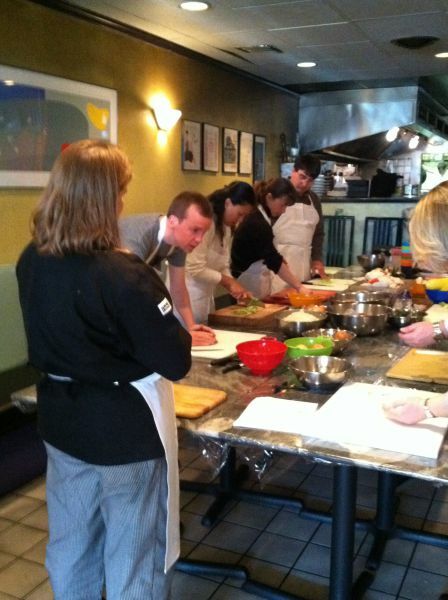 This class is fitting for those who are slightly knowledgable in the kitchen but we work with all!. One of our most popular classes, pleasing to all! COME LEARN IDEAS ON HOW AMERICAN CUISINE HAS EVOLVED LIKE ​MODERN POT ROAST, LOBSTER MAC N CHEESE, CALIFORNIA STYLE SALADS, HOW TO MAKE A CREATIVE GUMBO, SQUASH SOUP, MULTI LAYERED FLAVORED MEAT LOAF , GINGER LEMONGRASS PUMPKIN TART AND ... MORE. COME LEARN THE NUANCES OF FISH COOKING AND FISH SAFETY FOR THE SPRING AND SUMMER MONTHS. LEARN GREAT SALADS, SOUPS, AND SAUCES TO GO WITH THE FISH AND SHELL FISH WE WILL BE COOKING. THIS IS A GREAT CLASS FOR THOSE WHO LIKE TO EAT HEALTHY FISH DISHES, BUT WANT TO LEARN NEW WAYS TO COOK THEM AND PROPER TECHNIQUES FOR COOKING AND BUYING FRESH! POLICY FOR ALL CLASSES - We DO NOT offer refunds as we keep our classes small and often turn people away, so we must adhere to this policy as we may not always be able to fill the spots as we get closer to a class date. You MUST call and reschedule in advance (2 weeks notice) or the monies will be forfeited to cover the costs of food, aprons, and recipes made available or purchased for you to attend. You may however, with LESS than 2 weeks notice, reschedule for another available class BUT there will be a $20 food fee added to resechedule to another class. Keep in mind some of the food items we purchase far in advance, for all participants. All classes must be prepaid, based on our class size being limited to 10 people, and our no turn away policy for gift certificate holders who have been prepaid. We DO NOT offer refunds for gift certificates. We do, however, honor the gift certificates for dining in the restaurant or for a later scheduled date with confirmation of availability for the class. CLASS FEES ARE $65.00 PER CLASS, and as stated above if you sign up 2 weeks in advance for a specific class, should you decide to join us with less notice the fee is* $75 signing up the same day or a few days in advance as we have to purchase more food last minute. * please see above for fees for rescheduling with less than 2 weeks notice. If you are buying this as a gift, we suggest you purchase an open-ended $75.00 gift certificate so they can pick and choose a class on a suitable date for them. Please we ask of you, DO NOT sign up for a class unless you are sure you can come, as we turn away so many too often. We REALLY appreciate that! * $75 gift certificate allows you to sign up at any time or reschedule with out the food fee. * PLEASE NOTE: We treat these classes like a ticket, so if you require a email confirmation we will send you one, BUT we are NOT responsible if the email ends up in a spam folder or is deleted. We will confirm with you verbally over the phone only, unless otherwise requested. You MUST bring and hand in any gift certificates upon arrival. If you do not show up, we won't be able to help you, so please call immediately and we will work with you, but keep in mind there is always a fee for the food we purchased for you, so to reschedule we will have to charge that fee. We often have a waiting list and we cannot afford "no shows". Also keep in mind we have a parking lot and it's FREE ... ( at 1910 Aliceanna St, across from DARBAR ) so we can be prompt and will start the lecture on time. ALSO KEEP IN MIND, IT IS A HEALTH DEPARTMENT REGULATION THAT NO FLIP FLOPS OR OPEN-TOED SHOES ARE ALLOWED IN THE KITCHEN. So we ask you to refrain from wearing them to our classes; come with comfortable shoes, you will thank us for it! AND LAST BUT NOT LEAST ... IF YOU HAVE A GROUP GIVE US A CALL, WE LOVE DOING GROUP CLASSES !!! Classes are added weekly check back often!!!! 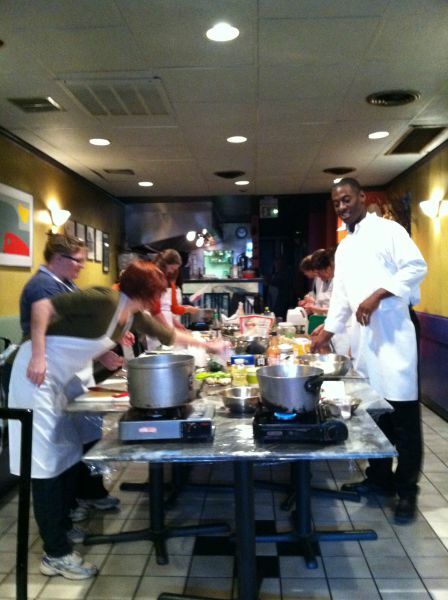 cooking classes for groups, singles, as well as private lessons !!! soon in 2016 we will be offering more, singles classes, during the week!!! For a set fee you can set up a single private lesson with chef Nancy Longo or a sweetheart lesson for 2 call for rates and well as options .